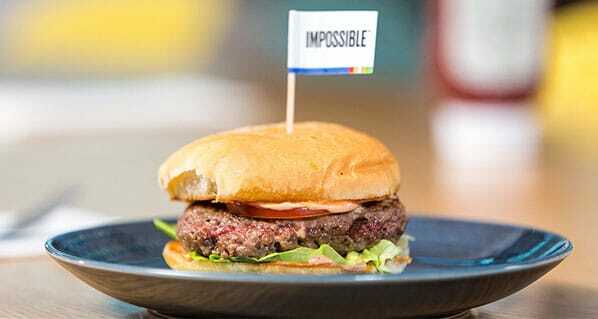 Last week, American company, Impossible Foods, presented the latest iteration of its plant-based patty, Impossible Burger 2.0, at CES, the popular consumer electronics show that takes place yearly in Las Vegas. What’s new on show at CES generates a media explosion of interest, but according to many attendees the Impossible Burger 2.0 was the undisputed winner of the expo. It doesn’t matter that LG showcased a mind-blowing rollable TV, journalists are still saying that the best technology of this year’s edition was a vegan patty of fake meat. That’s quite impressive. To describe the wins as a big coup for Impossible Burger would be an understatement. Impossible Burger’s attendance at the world’s biggest consumer electronics conference this year marked the first time ever that a food product was given an exhibit at the show. Though Impossible Burger has been on the market since 2016, the product was given a recipe makeover and showcased as the version 2.0 at CES: The newest version contains no gluten, animal hormones or antibiotics, and is kosher and halal-certified. The updated burger also has as much iron and protein as ground beef. “By shrinking the flavour gap between real meat and fake meat, Impossible is making it easier for everyone to make more environmentally-conscious food choices, and that’s a big deal,” said Digital Trends’ Drew Prindle, emerging tech editor. In the US, the new burger will be first rolled out in a few high-end restaurants and, from early February, in all Impossible Foods partner restaurants. Unfortunately, the Impossible Burger, even its 1.0 version, has yet to make it across the pond to the UK and Europe. Beyond the US, it’s indeed distributed just in Hong Kong and Macau. Last December, The Economist declared 2019 the ‘Year of the Vegan’ and many people agreed. The new Impossible Burger’s early 2019 success hints that this year will be no different. However, Impossible Foods doesn’t show intentions of resting on its fresh laurels. In a recent interview for The Spoon, the company’s CEO Pat Brown declared that the company is now working to create what many consider the Holy Grail (or Holy Grill…) of alternative meat: the steak. Producing whole cuts of vegan beef is a quite complex matter given the peculiar texture of animal steaks and Impossible Foods will truly have to live up to its company’s name. Product rival Beyond Meat, also a plant-based faux meat, is sold at A&W restaurants across Canada and at retailers like TGI Fridays, Target and Safeway in the US.